For the millions of people whose only experience of Nevada is a visit to the neon casinos of Las Vegas, where sunny skies and temperatures over 90°F are the norm, it may be a surprise to learn that just 250 miles north lie permanent snowfields and even a small glacier - these are found on Wheeler Peak, central attraction of the Great Basin National Park. 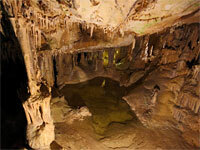 Varied wildlife zones and great views over distant mountain and desert scenery make this a pleasant change from the featureless grey-green, sagebrush-covered plains that stretch over much of the state, and the park has another unusual attraction in the Lehman Caves, a cavern system with many beautiful limestone formations. 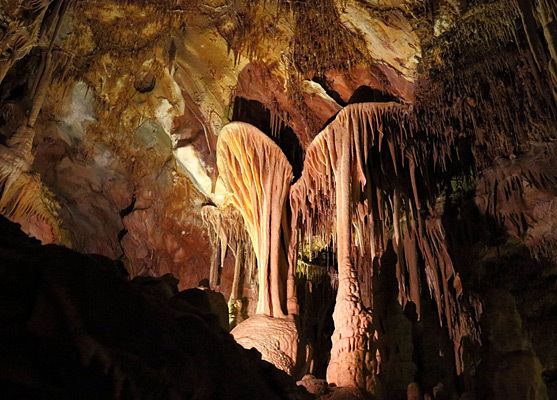 Great Basin is probably the least known national park in the southwest, partly as it was created quite recently, in 1986, prior to which only the caverns were officially recognised, as the Lehman Caves National Monument, and partly as the area is far from any other famous landmark, and not reached by any major cross-country road. As with some other mountains, such as the San Jacinto range near Palm Springs and the Guadalupe Mountains of Texas, as well as other hills in the Basin and Range landscape of Nevada, Wheeler Peak rises like an great island from the surrounding desert; at higher elevations, moisture increases and the temperature falls, resulting in different plant and wildlife zones over a vertical distance of 7,000 feet. The foothills of the park lie at an elevation of 6,000 feet and are part of the Great Basin Desert of Nevada, an area dry for most of the year and characterised by long wide valleys interspersed by narrow mountain ridges running generally north-south. Great Basin National Park is close to US 50, supposedly 'The Loneliest Road in America', and the only trans Nevada route that crosses into Utah for 210 miles, between I-80 in the north and NV 319/UT 56 further south. Just 7 miles from the state border, another lonely road (NV 487) branches off; the park entrance is along a side road near the little town of Baker, after which NV 487 continues into Utah, becomes UT 21 and traverses wide-open, empty lands for 120 miles before eventually joining I-15. Wheeler Peak is part of the Snake Range, one of the many mountainous ridges that restrict east-west travel in Nevada; on the west side scenic highway US 93 provides an alternative approach to the area, and the route to be used if starting from Las Vegas. Just beyond the park entrance, a ten mile scenic drive ascends 3,400 feet into the mountains, with excellent views of the surrounding forests and canyons, and across to the desert in the distance. 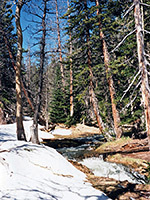 From the park entrance to the snow-capped summits there is an elevation difference of over 6,000 feet, and the steady changes in temperature and moisture result in a transition through several distinct vegetation zones from ponderosa pine and oak woodlands, through thick forests of Douglas fir and aspen, which become interspersed with grassy meadows, rocky outcrops and occasional lakes, and finally above the treeline, where only mosses and lichen survive. Scattered groves of bristlecone pines occur at elevations around 10,000 feet, and one specimen has been dated to be 4,950 years old, competing with similar trees in the Sierra Nevada mountains of California to be the oldest known living object on Earth. The varied zones give support to a wide range of wildlife, much of which could not survive in the desert basins. There are three official campsites within Great Basin National Park; the highest is at an elevation of 9,886 feet, and so experiences chilly nights most of the year. A good (free) alternative is close to a gravel pit, 2 miles north of Baker and a short distance east of the main road NV 487, but out-of-sight of passing traffic. This is quite a memorable location, with uninterrupted views over many miles of flat desert in the Snake Valley to the east, and a palpable sense of peace and isolation at night. 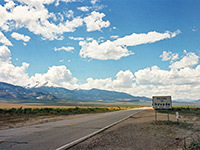 The nearest major town with hotels close to Great Basin National Park is Ely (66 miles from the main entrance).